VCU Athletics has announced a broadcast package as part of the Atlantic 10 which will feature 15 nationally televised conference games. This is in addition to two already scheduled non-conference games against Charleston (NBC Sports) and Wichita State (ESPN2). RICHMOND, Va. – The road to March will be televised. VCU will appear on 15 national broadcasts as part of the Atlantic 10 Conference’s robust television package, the league revealed Wednesday in its 2018-19 schedule release. Thirteen of VCU’s A-10 match-ups will be carried on a national network, and the Rams’ non-conference contests against Charleston and Wichita State were picked up by NBC Sports Network and ESPN, respectively. 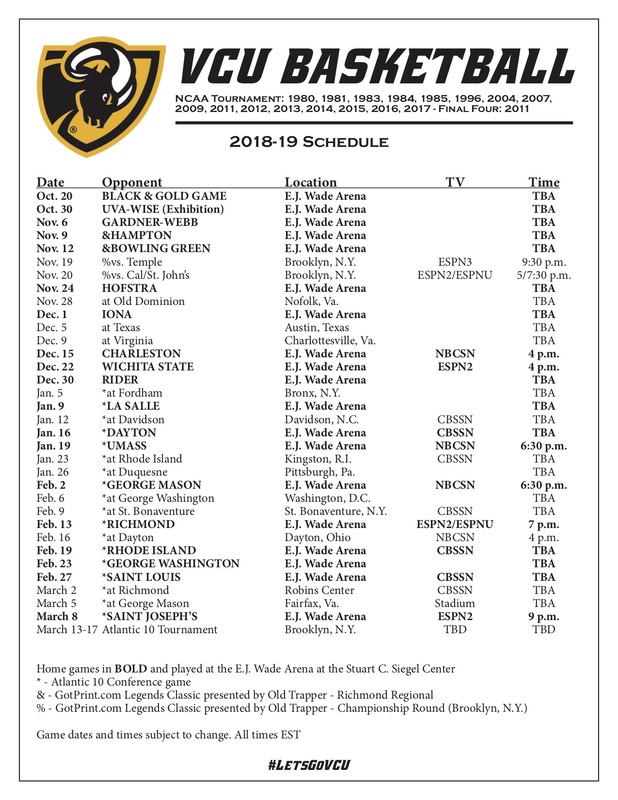 In all, 17 of VCU’s 2018-19 games are currently scheduled to air on a national platform, including five on ESPN’s family of networks (not including ESPN+), seven on CBS Sports Network, four on NBC Sports Network and one on Stadium. VCU will begin its quest for the 2019 Atlantic 10 Conference Championship, which returns to Barclays Center in Brooklyn, N.Y., on Saturday, Jan. 5 at Fordham. The Rams will return to Richmond on Wednesday, Jan. 9 to host La Salle in their A-10 home opener. The Rams will visit defending A-10 Champion Davidson on Saturday, Jan. 12, a contest which will air on CBS Sports Network. VCU will rekindle its rivalry with Richmond at the E.J. Wade Arena at the Siegel Center on Feb. 13, a game set to broadcast on either ESPN2 or ESPNU. The network will determine which channel will air the game at a later date. The return game at the Robins Center is scheduled for March 2 on CBS Sports Network. The Black and Gold will renew its hotly contested home-and-home series with Dayton on Jan. 16 at E.J. Wade Arena (CBSSN). The Rams visit UD Arena on Feb. 16 (NBCSN). VCU will also face A-10 contender Rhode Island on Jan. 23 in Kingston, R.I. (CBSSN), as well as on Feb. 19 in Richmond (CBSSN). VCU will close the regular season on Friday, March 8, when it hosts Saint Joseph’s in a game televised by ESPN2. Television information released Wednesday includes only Atlantic 10 contractual coverage with its partners. Additional regional and local television coverage will be announced at a later date. All games not picked up on linear television will be streamed through the A-10’s digital partnership with ESPN+. New VCU season ticket orders for 2018-19 will be taken starting in September through the season ticket wait list. Please click here to be added to the wait list and to be contacted when seats become available.